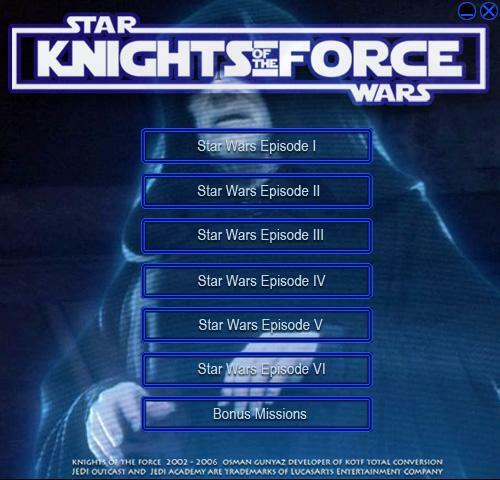 Knights of the Force (KotF) is an expansion pack which recreates Jedi Academy with levels, characters, environments, weapons and vehicles and combined them with the 6 movies, games, and cartoons. 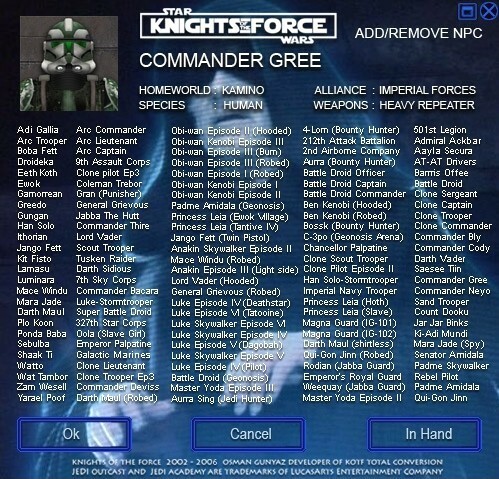 However the Knights of the Force 2.0 (developed between 2003 and 2008) is a Jedi Academy Modification, it is also a detailed Star Wars encyclopedia, because of its many historical characters and scenes. You can find detailed information about all the characters can be found in this menu such as background story, weapon, clothing, height and available force powers. 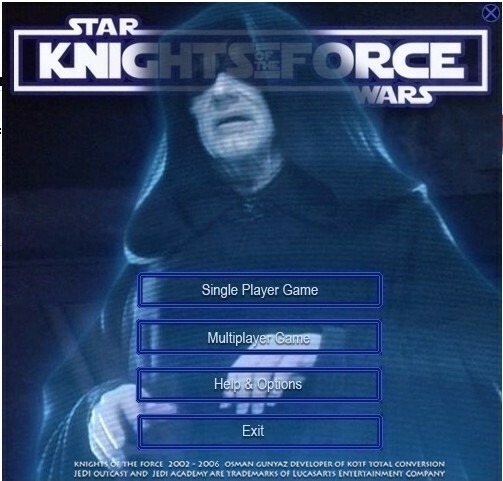 KotF includes 100 new Star Wars characters, 150 skins, 70 original Star Wars light sabers, 40 vehicles, 50 new stages, 130 NPCs, a new and upgraded menu, and 70 multiplayer maps. You can see some characters in the NPC add/remove menu. All these new features are about 2G large! The maps and models have been remodelled with movie standards to look more realistic. KotF is being developed in 6 languages, which are; Turkish, English, German, Spanish, French and Portuguese. KotF also includes more than 50 in-game video and cinematics and around 30 new pieces of music. Original movie sounds were used to voice about 100 new characters, and "mission completed" and "mission failed" animations were added for each different level. KotF has lots of new modifications, improved functions and options, the end result is an spectacular, new, and fully homogen game, which won't make the gamers remember they are playing a JA mod. 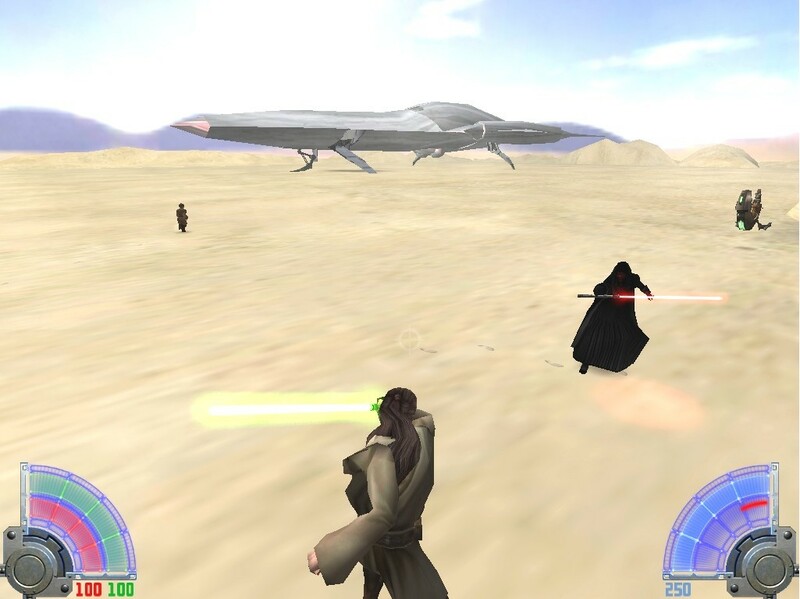 Thousands of the fans are still using and playing the single and multi player games with the popular Star Wars Jedi Knight 3: Jedi Academy. But since they hadn't got new campaigns, characters, and maps they had to make some for themselves. Many new mods, new missions, new skins, new weapons were created by the fans. 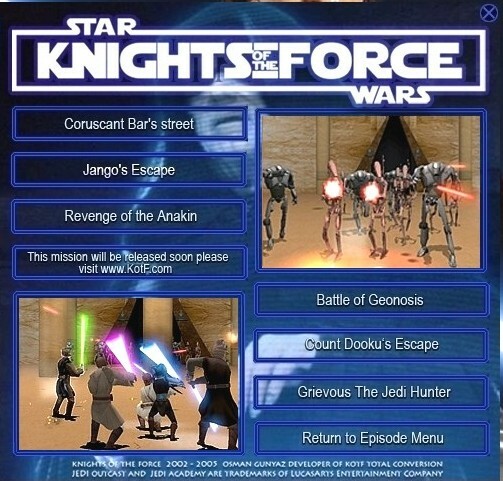 Maybe these mods gave the idea for the developers of the KOTF to create a game that combines the most important scenes of the Star Wars universe, the main battles, the planets, the interiors, all important Star Wars characters, within a single game. We can control almost all the well-known characters using modified weapons throughout the main locations of all six episodes, so you can try yourself in the original movie scenes. Don't you want to live the original adventures? You can take part, even in an allied team, or like a single wolf. You can live through the epic duels also. You choose which side, which character you want to control and you start playing right away! You can change to Light Side or Dark side with a single click. You didn't like what you saw in the movie? Wanna change the history? Build your own scene with the map editor, place the bots (as hostiles or friendlies) and try to change the film events yourself! You were sad when master Yoda fell down from the floating senate platform, and had to escape? Create your fantasy duel at anytime you want, be Yoda, and destroy the Emperor! Would you like to fight together with your fellow Jedi companions in the Geonosis arena? Create your own scene, release the droid army, and saber down those robots! 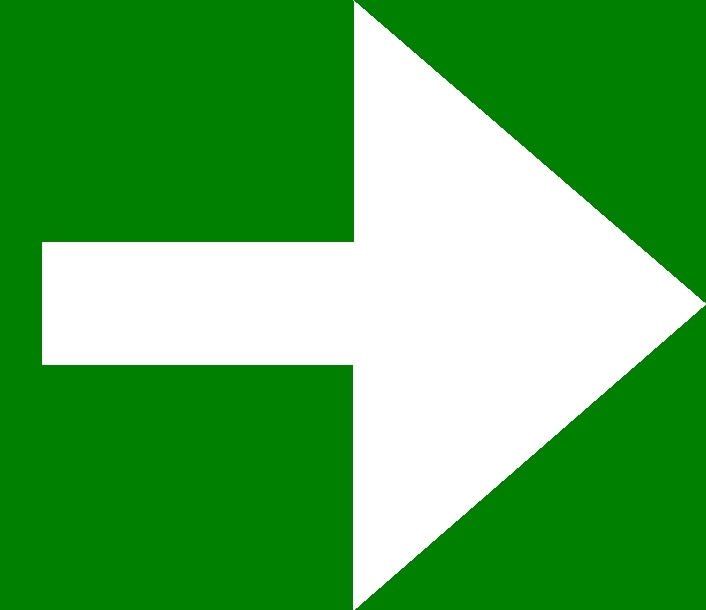 Or if you get tired of it, just turn the tide, and control a droid instead! You can destroy the Jedi Order once and for all, just shoot those trapped lightsaber wielder Jedi knights in the middle of the arena. And I could list many other great playable missions, that you can create for yourself till the original maps become available. Most of the built-in Part 1 scenarios unfortunately aren't operational yet, just a few are available for the audience, the majority of the levels will be finished and opened later on. So lets see the functional and already playable missions! We watched the young Anakin and Qui Gon Jinn chased and attacked by Darth Maul in the desert. With his unique half-moon shaped speeder he wanted to knock over poor Anakin, and the devil-head Sith wanted to overrun and kill the Jedi master too. You can play the scene! Choose your character at the beginning of the game! If you are controlling Qui Gon, your primary mission is to gain some time for the little Anakin till he reaches the ship. If he gets inside the safe Naboo Nubian, enjoy yourself in the desert. If you got the mood, hop onto Darth Maul's derelict speeder, and take a ride with this fast vehicle, which is cool as you cannot use that in any other game! You can try to knock Maul down, (he deserved it!). I personally saw Darth Stryker approaching Darth Maul with full throttle, then he jumped down the bike up in the air, like Maul did in the movie, igniting the saber in the air, and unstoppable ran down Maul killing the Sith soon. In this meaning Qui Gon took revenge for his death in the movie, or at least you can prevent this sad event in the game. Whoever cannot defeat the strong Sith, can slowly backtrack towards the ship, luring Darth Maul close to the Nubian, where the young Obi-wan Kenobi flies to his master's aid as soon as he realises Qui Gon is in trouble. Together will be easier to saber down Maul. But if you wanna revenge Maul, who's career was "cut" in the Core of Theed, here is the chance! Select Darth Maul, and prove to be worthy against two well-trained Jedi. But this one will be a tougher challenge for a novice lightsaber acrobat. 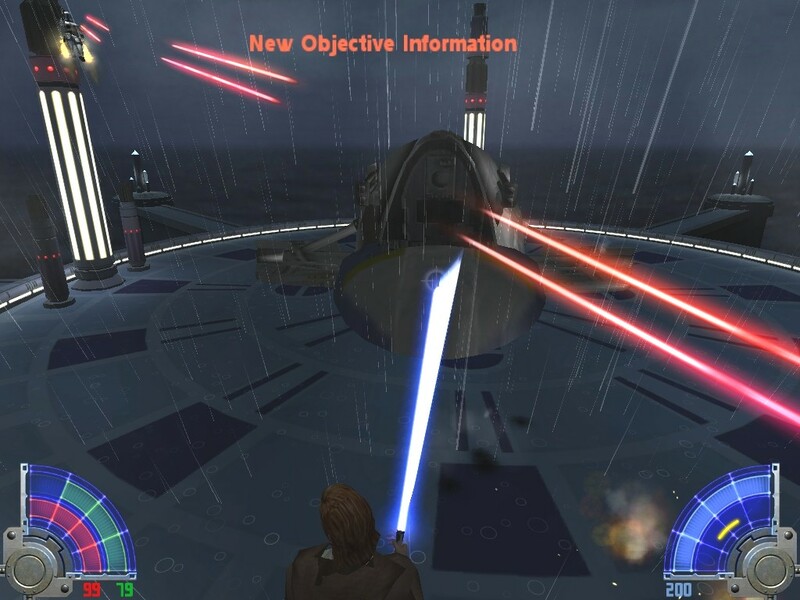 You have the chance to play the Obi-wan Kenobi against Jango Fett duel on one of the Kamino platforms in the pouring rain. You will see Ewan Mc Gregor running to a glass door in a video insert, and he goes out to face Jango. 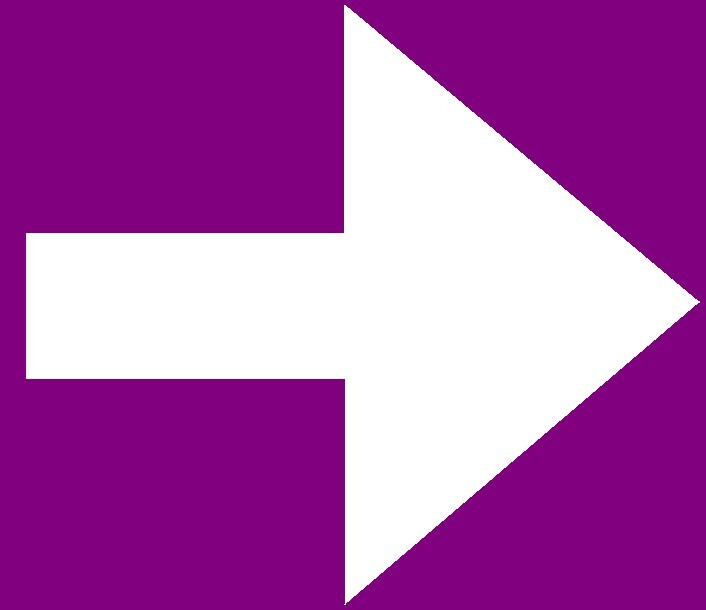 Now it is your time! You will have a "new objective", you gotta kill Jango Fett. 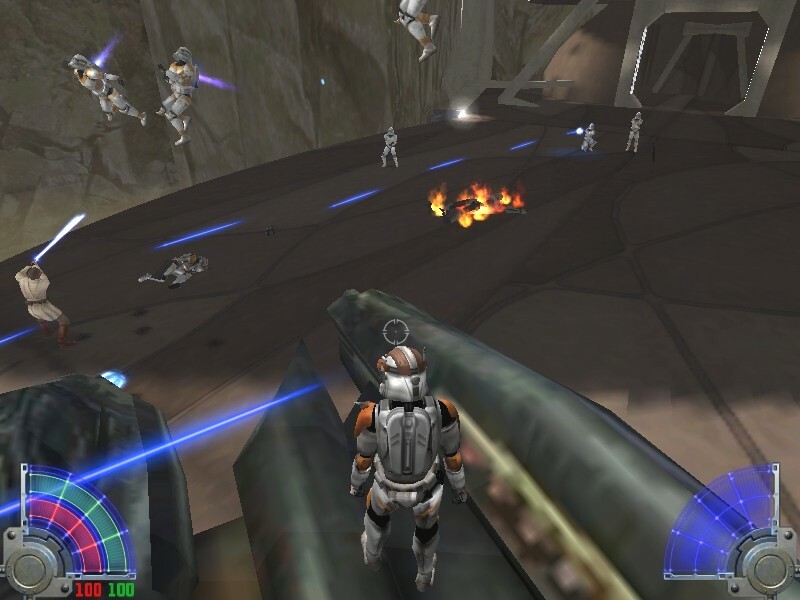 By the time this message appears on your scene, Jango has already flown in the sky, and started to fire like crazy at you from his double pistols. Skilled players may had enough time to ignite their lightsabers, or jumped away or strafed sideways, the remaining players probably had already got the first dose of ray. Jango keeps firing for a while, then after bored with it, starts using heavy rockets to finish us! You gotta Force Push them back! But the young Boba also gets angry for us, and turns the Slave 1 to us, and gives us a heavy cannon fire. If the cats have 9 lives, they probably also lost at least 3 or so in this sort of welcome party. If you are alive, rush to the Slave 1 and destroy the explosive objects around the ship, it makes a large detonation, that destroys the dangerous Slave 1! Then you "only" have to deal with Jango Fett, try to Force Pull him closer, and saber him heavily, if you keep doing this for a year, Jango may be eliminated... If you finally finish him, don't lean back yet! In some of the stages you go to the next stage by winning, so you can unlock secret stages! There pours out a dozens of clones from that glass door, and they are very sad about loosing their genetic father, so they want to see you share their sorrow with true mourning, and they are ready to use any kind of weapons and grenades to convince you to do so. So without a god mode, or invulnerability this stage is quite hard, almost impossible to succeed! But if you select Jango Fett in the very beginning, you wont have to face "The Revenge of the Clones" at least. 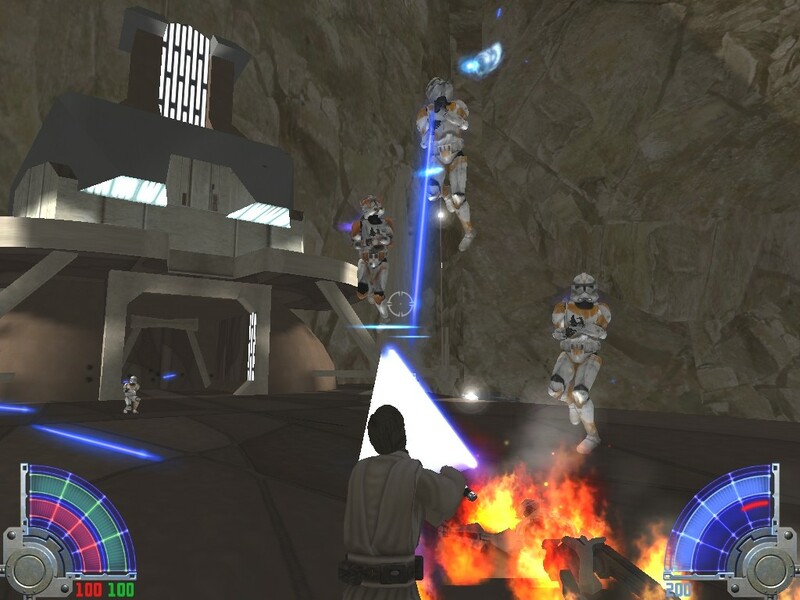 As your bonus mission you can box against Jango Fett, copying that scene from the film, when Jango's jetpack flew away, this will be a "melee" fight first, but later you'll get back your lightsaber, he gets back his pistols, and you can kill him once more. General Grievous vs. Obi-wan Kenobi! 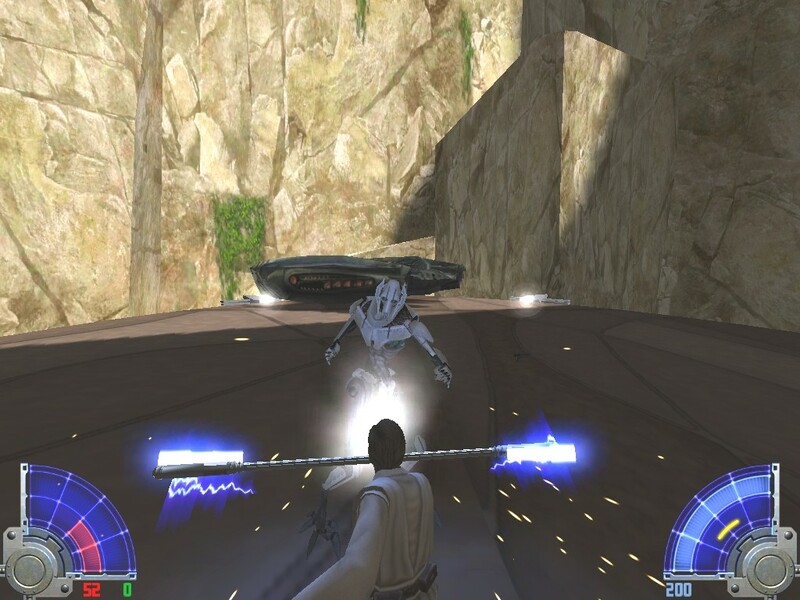 Grievous attacks the Jedi master with bare hands, so you can try the improved melee mode! You can find some players, who like to duel bare handed, they switch off their sabers and prefer melee fights on the Internet. The duelists can punch each other with equal strength, but this time Grievous will punch you so hard like a horse kicks! So I suggest to keep a safe distance, and hit him with his vibrostaff. Also, you can pick up his lost blaster from the ground, and use that to weaken the General. Weaken, because this time you wont be able to kill him by opening up his chest armor, and to target those inner organs with the blaster. You cannot kill him, there wont come flames out of his eyes like in the movie, maybe the armor will sparkle a bit. You can not damage him too much with this weapon, so you gotta use the vibrostaff. It is a difficult task, but if you keep the distance, keep moving, this will be the easiest out of the three available episodes. 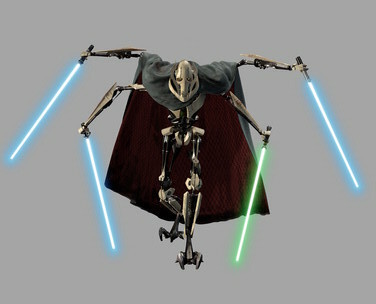 Of course you can select general Grievous too, in the very beginning, and you can beat down that "pathetic" Jedi. You will get your lightsaber back for the bonus mission, hurray! You wont have to use that vibrostaff, just watch out, Grievous! But hey, he also got lightsabers, and not only one, but four! "Attack Kenobi"... If you have played Battlefront 2 previously, and used General Grievous with 4 sabers, you may remember that butchery that Grievous can do with 4 sabers, you will experience about the same this time, too. There is an other playable Episode 3 KOTF scene, you can control the 212. Attack Battallation (Cody's orange squad) at Utapau. They receive Order Sixty-six from Palpatine, but it seems the ammo has gone out of that artillery, what they used to fire at Master Obi-wan Kenobi, who was riding a giant Utapaun lizard-like creature, called Boga. Since they attack general Kenobi on foot, with hand weapons. We control commander Cody, and we can select from his clone troops by rolling the mouse wheel. If you select a clone, you will start controlling him, and you can participate in the battle with a foot soldier. If your selected men got killed, you can choose an other one, and can continue attacking Kenobi. So with this you'll have a few chances to execute Emperor Palpatine's order. But if you'd like to control Obi-wan instead, you'll have to be prepared for a heavy shooting from all around you, from the doors, from front, from the sides, and even from above! Our faithful reader Darth Stryker has sent an interesting screenshot, which he think is depicting a scene like if Obi-wan deflected back a shot to a clone, whose head swung back. Commander Cody immediately threw a glance at his man, sizing his status. Thanks for Darth Stryker who sent these great KotF screenshots! The newest Force Unleashed based expansion pack is said to be more beautiful. The bodies don't disappear, the blood remains on the floor, the environment slightly can be damaged, the shots leave impacts in the walls, the bugs were fixed, the AI is smarter, runs away to find cover, so the project is still advancing! KotF's Turkish developer, Osman Gunyaz will surely conquer the world with this. 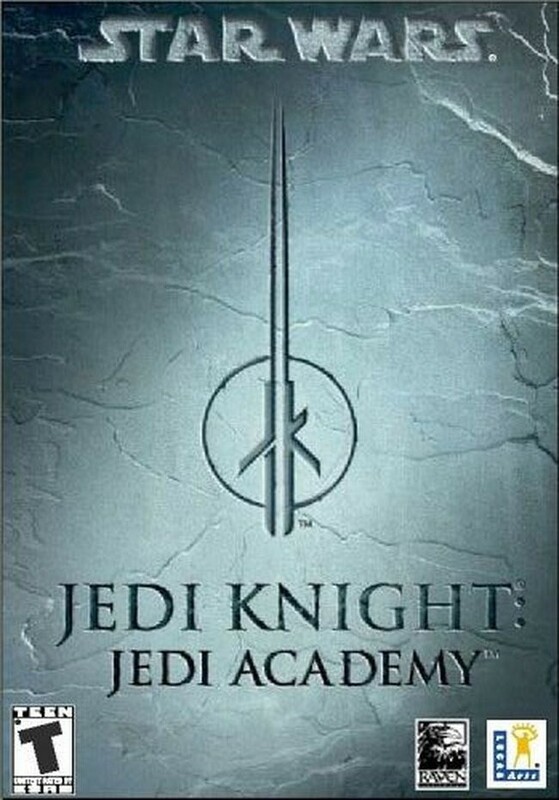 He created a great, nice, and enjoyable game, which is a worthy part of the Jedi Academy saga! Thanks for reading CustomStarWars articles.